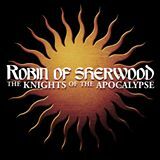 The Robin of Sherwood TV series was a show like no other I had experienced before with subsequent adaptations failing to hit the mark. 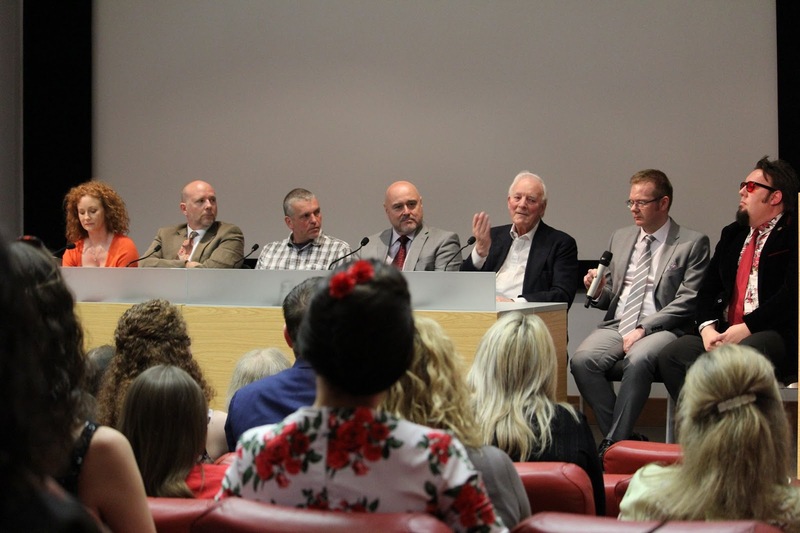 However, attending the premiere of Robin of Sherwood: The Knights of the Apocalypse was something I was delighted to agree to and, as I arrived at the Wimpole Street venue (The Royal Society Of Medicine), I knew that this would be a wonderful reunion with a show that meant the world to me as a child. I was also looking forward to meeting Barnaby Eaton-Jones, as his passion for this project had been inspirational to me and the scores of investors that supported it through crowdfunding. Through that, my enthusiasm for The Knights of the Apocalypse reached peak levels when Anthony Head and Colin Baker were announced as cast, with my theory being that the sheer quality of this endeavour must surely be matched by the quality of the names attached. Whilst this is not always the case, I know enough about Barnaby and his bubbling fervour to know that he would simply not let a project complete without a level of professionalism and quality that will enthral fans both new and old. The first thing that struck me about the premiere is that the fan base was far larger than I had imagined. I have to confess that I was not aware of Barnaby's considerable work in developing a very successful Hooded Man convention which had occurred a week or so prior to the premiere. Consequently both fans and cast were passionately supportive and raring to go as they started arriving. Robin of Sherwood seems timeless and the TV series set the mark for production value and scripting for so many shows that were to come afterwards. It is also significant in that it provided the launch pad for so many amazing careers and made household names of Ray Winstone, Jason Connery, Clive Mantle, Judi Trott and Mark Ryan. For fans and cast of the show alike, "the cast are the show and the show is the cast". Knights of the Apocalypse would have not worked if the original cast had not been present and so it was exceptionally important that this was a reunion project in memory of the tremendously talented Richard "Kip" Carpenter. The story of how Knights of the Apocalypse came into being is an interesting one, with the script being adapted from an original Richard Carpenter TV episode. A fan had the only copy and was in the process of auctioning it, however, once she heard it was needed for the production, she gave it back and production was planned. Knights of the Apocalypse is a standalone audio and does not deal with the loose ends created by the sudden cancellation of the series back in the Eighties when the planned fourth series never saw the light of day due to the abrupt demise of Goldcrest. It is worth pointing out that Robin of Sherwood was immensely financially successful but it could not sustain the ailing company on its own. To reunite the original cast for an Audio adventure is a challenge even without dealing with a TV series that is so immediately iconic and visual. I share Spiteful Puppet's sound designer Iain Meadows' opinion that "you can replicate anything you see visually in audio form". Whilst this is the case, so often when I have listened to different audio drama in the past, even the most assured and talented of actors have failed to deliver when the project is audio only. When you add into the equation the necessity for period detail and realistic sounding battle sequences, the task to bring this project to fruition was no small one. Before the premiere, we were to be shown a Making Of documentary and then we would get to listen to the first 30 minutes of Knights of the Apocalypse. I also had the pleasure of chatting to the cast. My first impression was that, although Jason Connery is no longer in possession of his trademark blonde locks, he has lost none of his wit and passion. Listening to him recount stories of filming Robin of Sherwood, it is immediately clear that he loves the show as much as the fans do. That sounds like such a trite and over used phrase but, when you consider that actors move from project to project at speed, to be speaking with so much tender affection for a show that he filmed 30 years ago is statement enough. He is not alone with this as Mark Ryan, Judi Trott and the entire cast also share the intensity of feeling. It was also wonderful to meet Harriet Whitehouse (Richard Carpenter's daughter) and the affection that cast and fans demonstrated for her father must have been a deeply touching experience. Talking to the cast, it became clear that they had recorded their performances largely separately and I was keen to learn whether this was going to be obvious when listening to the audio. I have long believed that Robin of Sherwood works so effectively because of the ability of the cast to weave their magic together as an ensemble. The potential for success with Knights of the Apocalypse may well rest in the ability for the production team to break through the audio barrier and reconnect with an audience or fan base that wants to meet The Hooded Man again. Having listened to the first 30 minutes I can report that ROBIN IS BACK! The entire auditorium erupted into appreciating applause as Barnaby and his team delivered an audio experience that is every bit as good as its television cousin. The cast sparkle with electricity and it just doesn't feel like 30 years has passed at all. The sound quality has the level of professionalism you would expect of any full-cast audio drama with the effects used to denote period detail perfectly placed. Judi Trott is still completely the Marian that I remember and sighed over as a boy and I felt a mixture of strong moral fortitude and deep love for the man who leads the Merry Men. Mark Ryan had expressed concern that he was more an action man and we laughed when he said he had more lines in this project than the whole TV series. Ryan is a talented and professional actor who succeeds in bringing back to life his character's all-action image whilst at the same time adding additional resonance by being more vocal. Ray Winstone is hilarious with his acerbic put downs and much of the audiences laughter was in hearing him voice Will Scarlett again. Before the attending audience were treated to a fantastic photo opportunity with the cast, there was a chance to question them. What struck me about this particular Q and A was the level of engagement the cast had with their fans. Infused with genuine affection and appreciation, Connery et al happily reminisced about the past as well as giving insight into the recording of the audio. The highlight of this was a well told gristle story involved a hauntingly reoccurring leftover from a steak dinner which would reappear in Connery's bowl, plate and even Bloody Mary. I don't think I will ever be able to lose the image of Clive Mantle digging around in a field to find the offending piece of discarded meat after Connery had thrown it out of the window. As the photos are completed and cast and fans move to a nearby pub for post event celebrations, the overriding impression is of a show that captured the heart of several nations and, as the festivities continued late into the night, Herne's son is most definitely riding high again. I will be reviewing the full audio at a later date but I can already say that Barnaby has achieved in doing what so many have failed to before him. 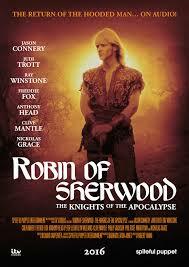 The Hooded Man walks amongst us again and I couldn't be happier! Photography - Kim Jones, other images - KotA.